Increase your online ranking with this beginner guide to SEO! Search engine optimization (SEO) is an integral part of getting a site to rank high in the various search engines in order to attract potential customers. 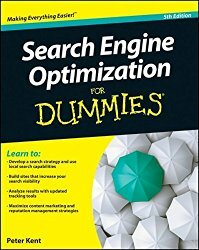 With this new edition of a bestseller, you?ll learn the ins and outs and best practices of successful SEO in order to make your website content more search-engine friendly so that it ranks higher among search engines and draws high-volume traffic. Covers search engine basics to help you get started Introduces new coverage on content marketing and reuse, new tracking tools, platform management, and reputation management Details ways to build search-engine friendly sites, register your site with directories and indexes, and use analysis tools to track results Explains how to use link popularity in order to boost rankings Zeroes in on advertising your site by using pay-per-click options Search Engine Optimization For Dummies, 5th Edition is the fun and friendly place to start learning how to move your site to the top of the rankings.